Slice cakes in half lengthwise; place in single layer in a 9×13 inch baking dish. Beat cream cheese and sugar at medium speed with an electric beater until smooth, about 1 minute. Add lemon juice and beat well. Fold in 1 container of whipped topping; spread mixture over cakes. 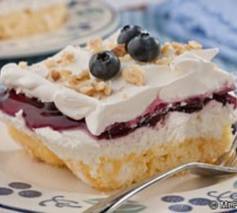 Spoon pie filling over cream cheese mixture. Spread with remaining container of whipped topping. Cover and chill at least 2 hours before serving. Evelyn always seems to be able to pull a great recipe out of her hat! We served this at our “Lemons & Leftovers” Event to RAVE reviews! Hope you enjoy it as much as our clients did!